A relatively low-volume Thursday with only six games on the slate. Streaming is going to be difficult in most competitive formats unless the teams in action decide to manage the load of any of their players. Darren Collison could miss his second straight game, likely allowing Cory Joseph to remain in the starting lineup. Over his past four games, Joseph has scored just nine combined points but has managed 10 assists and 10 steals. Both categories are in high demand and as long as you don’t need production in points, Joseph could provide sneaky value as long as Collison is sidelined. The Timberwolves are heading for the lottery and the shut down of a number of players seems inevitable. The newest addition to the injury report is Taj Gibson who is questionable with a calf strain. If he is ruled out, it will likely be Dario Saric moving into a more prominent role with either Gorgui Dieng or Anthony Tolliver seeing an uptick in playing time. The Hornets are beginning to lose touch with the playoff contenders and a loss here would certainly make their task much more difficult. Michael Kidd-Gilchrist is going to miss the game with a concussion and so Frank Kaminsky should see close to 30 minutes. He is not a player that is going to produce in multiple categories but could help out in points if that is what you are looking for. The Nuggets are just half a game behind the Warriors and face a Wizards team that is almost done in terms of post-season play. They are coming off an impressive victory over the Celtics and have now won four games straight. They have actually been able to keep their full rotation on the floor for an extended period and it is showing in their on-court chemistry. As long as they are healthy there is not much to see from a streaming perspective, outside of Mason Plumlee who can chip in across multiple categories on any given night. The Wizards are still mathematically in with a chance of making the playoffs, although it seems highly unlikely. Trevor Ariza left Wednesday’s game with a groin injury and has been listed as questionable Thursday. It would not be surprising to see him on the sidelines and if that is the case, Troy Brown could have limited streaming value on what is a relatively low-volume day. The Jazz have a chance to pull level with both the Thunder and the Spurs as the battle for the top-four intensifies. It is now five wins on the trot for the Jazz and they are finally running at full strength, much like the Nuggets. The Hawks should not pose too much trouble for the Jazz, however, the second night of a back-to-back could play a factor. The Hawks are merely trying to develop their young core at this stage but will be looking to cause an upset over a well-traveled Jazz team. Kevin Huerter has fallen off after a short period of standard league relevance but remains a player worth looking at if you need three-pointers. After a disappointing loss to the Cavaliers, the Pistons need to bounce back against a tanking Suns team. Wayne Ellington popped off for 25 points in the loss, finishing with seven triples in 32 minutes. Blake Griffin was rested for that game and so Ellington is unlikely to see that amount of playing time again. That being said, he has been a consistent source of three-pointers since arriving and is most definitely a player to consider for streaming purposes. The Suns will be without a number of players Thursday which could ultimately result in a fringe player having a big night. Deciding who that player is going to be is far from an easy task. DeAnthony Melton could be worth a look if you need steals but his lack of other numbers make him a risky play. Mikal Bridges is rostered in just over 50 percent of leagues meaning there is a decent chance he could be on your waiver wire. He is a chance to play 40 minutes and could lend a hand in steals and three-pointers in a perfect world. The Mavericks are tanking beautifully and have won just one game from their past 10. Maxi Kleber had been playing well leading up to their last game but a wrist injury appears as though it is going to cost him another game. Salah Mejri saw increased playing time in the last game but remains a non-factor in standard formats. The Kings are likely still reeling after blowing a 28-point lead in their last game, going down by two points to the Nets. They are not going to make the post-season but are still playing hard each and every game. Nemanja Bjelica finished the loss with a double-double in 28 minutes but owners should not read too much into that performance. Prior to that he had played just 19 minutes in two straight games and had been trending down. He is worth keeping an eye on but would need to have another big night to move into the standard league conversation. 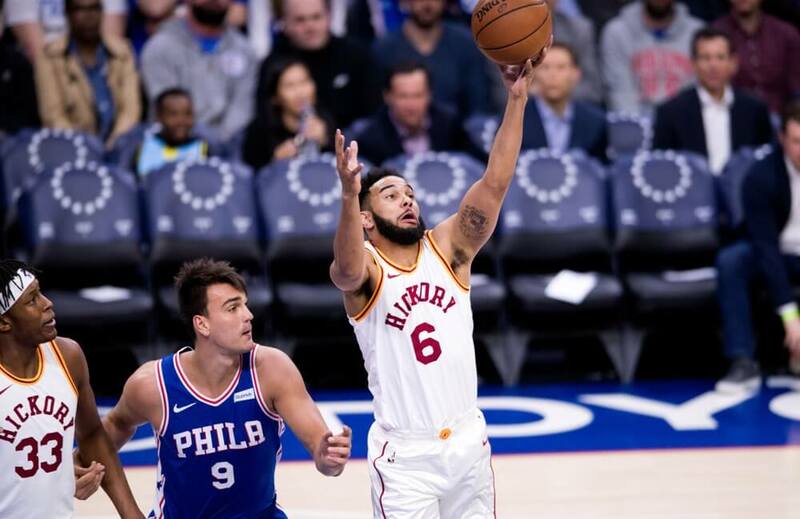 The 76ers staged an impressive comeback Wednesday, defeating the Celtics, allowing the Pacers to hold onto the fourth-seed. A victory here would be an amazing result given they are coming up against what could be a full-strength Warriors outfit. Darren Collison is questionable after missing Tuesday’s game with a quad injury. If he misses a second game, Cory Joseph will likely remain in the starting lineup. He typically scores very little but can help out in both assists and steals, making him worth considering for streaming purposes. DeMarcus Cousins has missed two straight games due to an ankle injury but appears as though he is ready to go for Thursday’s game. Andrew Bogut has started the last two games and it will be interesting to see where he fits into the rotation with Cousins back on the floor. As is typically the case with the Warriors, streaming value is virtually impossible to find and owners should focus their attention elsewhere. Adam King is new to NBA writing for FantraxHQ. He also currently writes for Rotowire and has previously written for Locked on Fantasy Basketball and Locked on Timberwolves. He has played sports his entire life with fantasy basketball becoming a passion over the past six years. By day, Adam is the service coordinator at the Autism Centre in Canberra, Australia. Adam was born and raised in Queanbeyan, Australia and currently resides in Bungendore, Australia with his wife and two children. Fantrax was one of the fastest growing fantasy sites of 2018. With multi-team trades, designated commissioner/league managers, and drag/drop easy click methods, Fantrax is sure to excite the serious fantasy sports fan – sign up now for a free year at Fantrax.com.